U.S. President Donald Trump delivered a powerful speech on January 30, 2018. Speaking to a joint session of Congress, Trump enumerated a list of achievements since his inauguration that pointed to U.S. gains both domestically and abroad. With the economy in rebound and unemployment falling, the President bragged about the financial benefits of his tax reform package for American families and businesses. His presentation had the popular tenor of Reagan and Lincoln, speaking using language explaining the direction of the economy to ordinary Americans; noting that, corporate America had already heard, and was already responding to, his clarion call. Internationally, Trump capped his Administration’s the nearly total rout of ISIS in Iraq and Syria by announcing he had signed an executive order instructing Secretary of Defense Mattis to keep the U.S. detention facility in Guantanamo Bay, Cuba open for business. 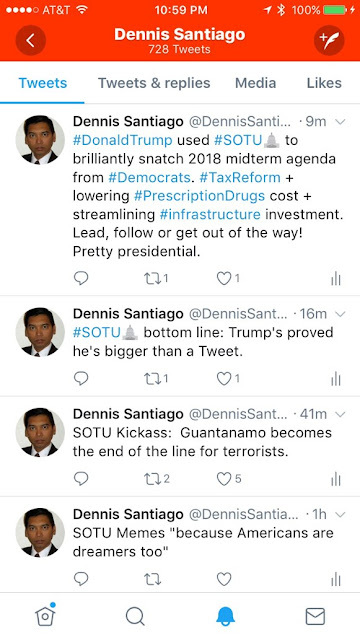 His message was clear, for terrorists, Guantanamo will be the end of the line. The U.S. intends that if captured, they will live out what remains of their lives in captivity. In other words, he’s created a tangible consequence and hopefully a deterrent to future radicalization threats against the United States in a tone that speaks to individuals contemplating terror. 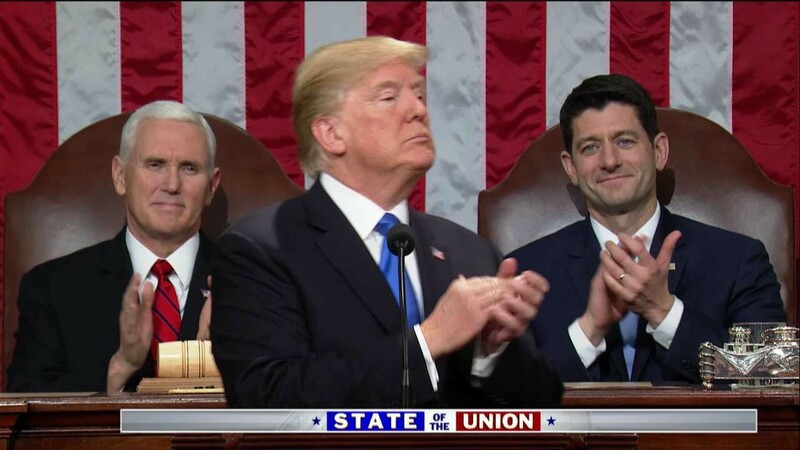 Against other adversary nations, Trump’s speech was more conventional in rhetoric criticizing the behavior of rogue regimes such as North Korea and encouraging popular liberation causes in places like Iran. His speech may have specifically asked Congress to fully fund the US defense budget and invest in the modernization of the US nuclear arsenal; but his activist messaging directly to other nations clearly continues to show that the most potent weapon in his arsenal remains the diplomacy of “aggressive negotiations”. Fittingly, cameras focused on U.S. Ambassador to the United Nations Nikki Haley as Trump made his remarks. The President also took the time in his address to explain his immigration reform package directly to the American people. He is clearly snatching the agenda away from Congress even as they debate the same topic working towards yet another continuing resolution to fund or shut down the government next week. He spoke that his four pillar proposal was a compromise. 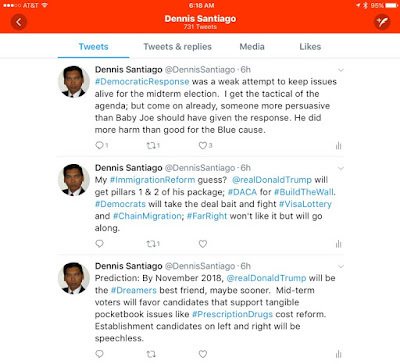 His message was clear, neither theFar Left nor the Far Right will be entirely happy; but, he intends to get a solution that will take immigration reform to a solution now and make it disappear from being a nagging wedge come the 2018 midterm election. 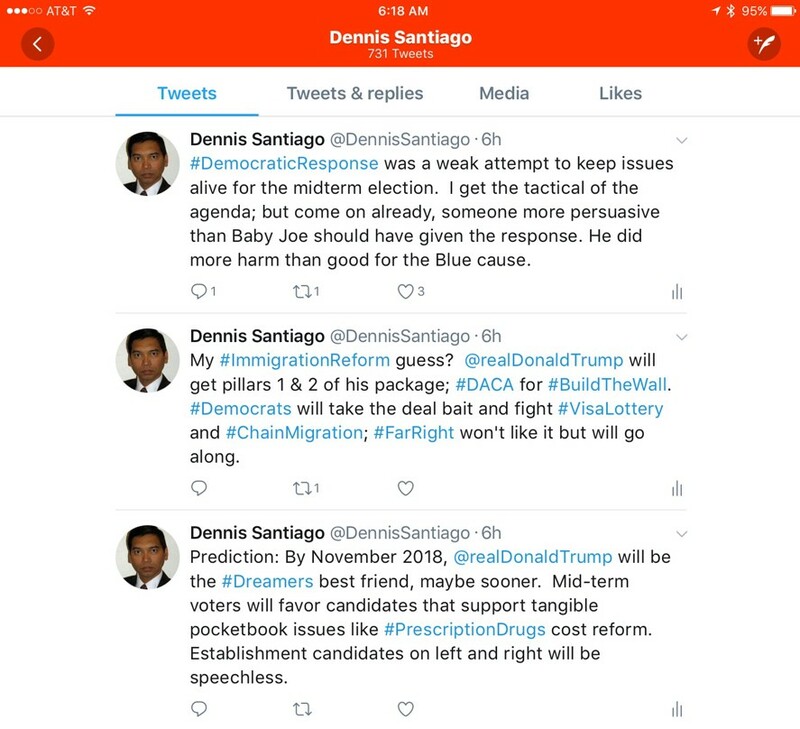 The President’s first two of four pillars approach consisting of a generous expansion of DACA with a real path to citizenship on the one hand and full funding for border security on the other was classic “Art of the Deal”. His third and fourth pillar addressing visa lotteries and chain migration focused on the consequence effects of these policies. My guess here? He’ll get pillars one and two. Three and four are bargaining chips to get one and two. However what really impressed me about the State of the Union address was Trump’s stunning, there’s really no other word for it, capture of the domestic quality of life agenda for 2018. His call for a solution to the high cost of prescription drugs where Americans spend as much as $1 of every $6 of their medical costs according to a Tweet by Fox News on the heels of his statement put him in direct communication with ordinary Americans yet again. His call to streamline infrastructure investment spoke to every frustrated state and local government. And his acknowledgement that America has an opioid epidemic problem brought light to America’s penchant to sweep inconvenient truths under the rug. 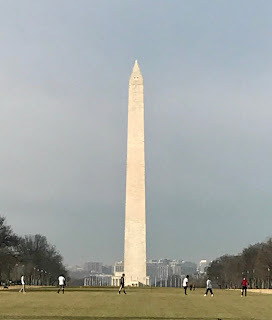 These are clear markers of President’s “connected” leadership based on honest recognition of domestic issues; something much needed in America. Applause by the Republican contingent and the audience in the gallery was enthusiastic. Reaction by the Democratic contingent, not so much. As the camera’s panned, I was moved to Tweet, “That’s a lot of unhappy Democrats” earlier in the evening. By the time I watched Joe Kennedy’s rambling response speech, I kind of felt sorry for the many loyal opposition Democrats that their leadership is stifling from participating more constructively in a bi-partisan process. Given the momentum generated but Trump’s State of the Union address, it’s going to be an interesting 2018 in the United States of America. “Getting to Yes”; Can Donald Trump Manage the Ultimate “Art of the Deal” and bring Korea to Camp David? What does it mean for the United States to have a provocateur President? What can a Nation accomplish when it looks at old problems with “out of the box” eyes? What pathways to global stability are open today that were not open when America led incrementally? As 2018 gets underway, the world has a unique opportunity to defuse and demobilize yet another worrisome point of tension in the international community of nations, Korea. 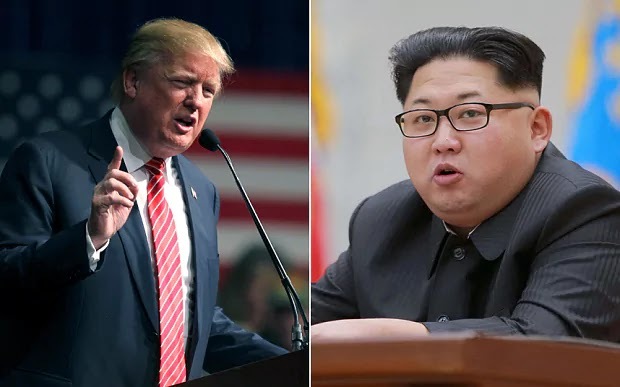 Have the efforts of the Unites States of America under President Donald Trump to shift U.S. posture from deferring confrontation to actively engaging the long festering nuclear weapons program of the Kim Jong-un’s Democratic People’s Republic of Korea aka North Korea, have created a unique opportunity to end one of the world’s longest and most artificial wars? On July 27, 1953 the Korean War Armistice Agreement went into effect. It ended open hostilities fueled by the Cold War; a war that ended twenty-seven years ago in 1991. For sixty-five (65) arduous years, Korea has lived in the shadow of that Cold War, divided along the 38th parallel. Culturally, these two Koreas are one people. Above all else, they long for re-unification. However, both sides are trapped by the dogma of the ghosts of NATO and the Warsaw Pact; their leaders unable to compromise to find ways to do the one thing they have to do, let go of their power so they then step together into a new and more peaceful dawn. Such a reborn Korea would no longer be beholden to external allies be they superpower, regional or rogue states; it would be, a Korea for all Koreans. Like prior post World War II pivotal collapses of international tension, there’s a massive potential dividend. Economically, a peacefully unified Korea is an enabler to a far more prosperous western semi-circle of the Pacific Rim. Ending the strife in the Korean Peninsula potentially unlocks a vast economic zone stretching from the Bering Sea to the Coral Sea. With so much of the world’s population, it would dwarf the European Union and be equaled only by a similar economic zone encompassing the totality of the Organization of American States along the eastern side of the Pacific Rim, which forms a most natural trading partner. The Pacific would literally become the center of such a world. The possibilities are HUGE, to use a term by “Donald the Strong” as the Chinese like to call him. But presently, concerning “externalities” remain. The DPRK is considered the rogue of rogues category state on planet Earth because of its provocateur stance vs. its neighbors near and far. It picks fights, potentially dangerously suicidal fights. It’s economy retains long obsolete features of a war footing economy spending most of its treasure to prepare for an imaginary war, a cold war of posture and bravado at the expense of the welfare of its people. It’s folly of course. Far larger nations like the Union of Soviet Socialist Republics tried the same thing and found in the end only heartbreak and regret as the denial of the cost of the sacrifice becomes undeniable. Some still remember that for a fleeting moment, a world cried with Boris Yeltsin when he visited those supermarkets in Texas. Even North Korea’s present data rogue cabal partner Iran, for all its oil wealth, makes the same mistake of spending too much treasure on bravado and adventure; only to wake up to the hollow shell it has become to its people. The plight of the Persians, one of the most worldly cultures of human history, at the hands of a narrow minded theocracy has only one future. The springing up of human rights and hopes will recur again and again. Each time the regime will be weaker within a world where the values of humanity and freedom challenge closed societies. So too is the sound of inevitability for Kim Jong-un’s regime. More important for North Korea’s posture and strategy, the possibility of the DPRK becoming a cabal of one became a very real possibility this year. To be honest, I cannot comprehend why North Korea has allowed itself to be the lightning rod of a nuclear warfare threat on behalf of its rogue cabal. For all the tired rhetoric about the United States being and existential threat hegemony bent on destroying regimes it does not agree with, these paranoid perceptions are plain wrong. If anything, the United States has proven over and over again since the end of World War II that is does not have the stomach for world dominating hegemony regardless of the Greco-Roman models used by its Founding Fathers to design the American Experiment. The U.S. track record in the latter half of the 20th and the beginning of the 21st centuries is in fact to lose heart and attempt to leave too soon; often with disastrous results measured in innocent blood. Even in places we stay, we constantly try to do less. What if North Korea could be convinced to think out of its own box and see the U.S. the limited fears of “that nation that convinced the entire United Nations to attack us”? What of the two Koreas saw the U.S. for what it did best after World War II rebuilding battered and devastated nations with in cooperation with countries, not despite resistance by those countries. 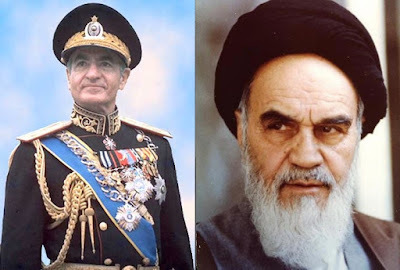 What if U.S. President Donald Trump was indeed able to convince the leaders of North and South Korea to come to neutral ground like Camp David like then U.S. President Carter brought Egyptian President Anwar Sadat and Israeli Prime Minister Menachem Begin for twelve days of secret negotiations in September of 1978? It was undeniably greatness. So let’s say “Donald the Strong” made it happen. Regardless of you domestic politics, would you think America was Great Again then?